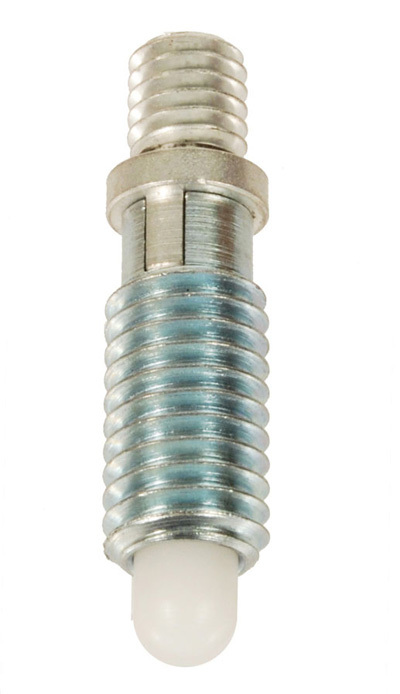 The new threaded adapter is designed to accept any internally threaded knob or handle. Available with or without locking element. Bodies are 12L14 steel or 303 stainless. The nylon locking element holds the plunger body securely in place without the need for lock nuts or other devices. We recommend a 90 degree countersink 1/32" larger than the major diameter of the mating thread to prevent damaging the element. Plunger can be withdrawn completely into the body and locked in a fully retracted position. To engage the plunger, simply turn to line up with slot in body.